There is mounting concern about an imminent volcanic eruption on the Indonesian island of Bali. Shallow rumbles from below the crust surrounding Mount Agung are stoking fears that it will soon blow its top, leading to the evacuation of 50,000 people from the surrounding countryside. The mountain has been groaning and growling since August, but a recent uptick in seismic activity alerted the authorities to the possibility that magma might be making its way ever closer to the surface, increasing the threat of an explosive eruption. Sunday saw a 200-meter plume of sulphuric smoke emerge from the peak, something that the chief geologist monitoring the situation said he had not seen before. The area surrounding Mount Agung is now under the government’s highest level of alert, with all communities recommended to leave. So far just under 50,000 people have fled to temporary shelters or moved in with relatives, but this figure is expected to rise to at least 60,000 over the coming days. Some have, however, elected to stay as they are worried about what will become of their homes, and more importantly, livestock. Around 2,000 cows have joined the humans making a dash for safety. 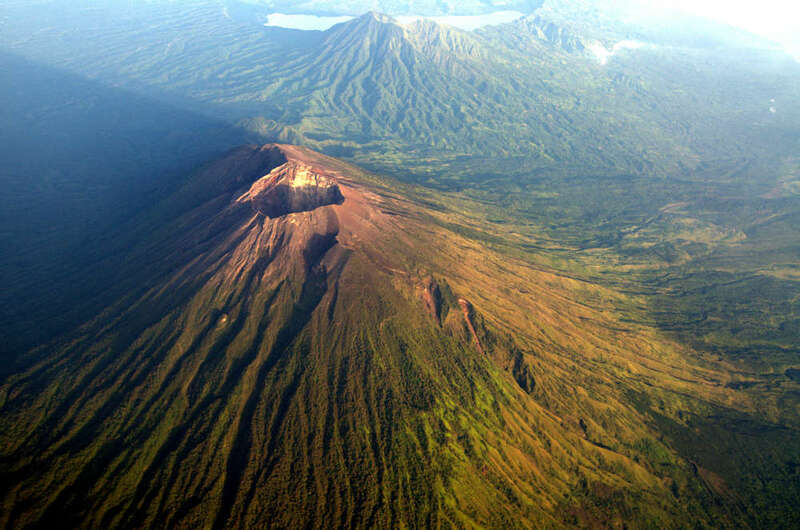 The mountain is the highest point in Bali and is what is known as a stratovolcano. This is the most common type of volcano. It forms as layers of lava, pumice, and ash cool on top of each other, creating its characteristic steep-sided profile. The lava produced by these volcanoes typically has a high viscosity, meaning that it cools quickly and doesn’t spread particularly far. Officials have imposed a 12-kilometer (7.5-mile) exclusion zone around the mountain. The volcano last erupted in 1963, after lying dormant for around 120 years. The resulting ejection of magma produced massive pyroclastic flows, with debris flying up to 10 kilometers (6.2 miles) into the air. In this first round of devastating flows, around 1,700 people were killed. Heavy rainfall over the tropical island further generated cold lahars, which are a horrific slurry mix of pyroclastic material, rock, and water, and killed a further 200 people. A second eruption a little later on in the year led to another 200 deaths. The expected eruption is not predicted to lead to such heavy loss of life. Improved technology means that researchers have been listening in to the mountain’s moans, giving local inhabitants much better forewarning. The surrounding infrastructure has also improved, meaning that people fleeing the blast can do so much more easily. Travel has not yet been disrupted, though there are warnings that if the volcano does blow, the resultant ash plume could impact flights across the region.